Could having a map of the brain help you in your work with clients? For example, just being able to show your clients what part of the brain controls emotion, or the nervous system, could open the door to helping them learn how to regulate these areas. For information on how to apply brain science to your work with clients, please click here. Thank you for this infographic. I am working with the LGBTQ Home for Hope in Philadelphia, PA, a shelter and recovery house for the LGBTQ community. I facilitate recovery meetings and other related programming both in the Home for Home and in the William Way LGBTQ Community Center. Free is always the right price for us since we (the Home for Hope) exist solely through donations. I love how you have labeled the parts of the brain. It’s quite easy for a non-professional in the field to look at it and relate it to something they will deeply understand quickly and easily. Elegant and simple method to describe a complex situation! Thank you. Thank you for providing this valuable information. Both my clients and I are very grateful. This infograph looks very helpful for clients! Thanks so much! I work as a client within the client group- to provide ourselves with the best information, and the best strategies to improve our lives, through historic trauma. Our vision is to work in tandem with the clinical industry- to achieve the best outcomes. Thanks… you offer hope in what is a terrible and terrifying condition. With all the glowing comments, I find myself a little reluctant to post. Then I saw Eric Andrews comment about the inaccuracies and Erin Wolfe, Mary Ann, and Nancy looking for a more accurate graphic. I’ll simply point to the recently published book, “How Emotions Are Made” by Lisa Feldman Barrett. 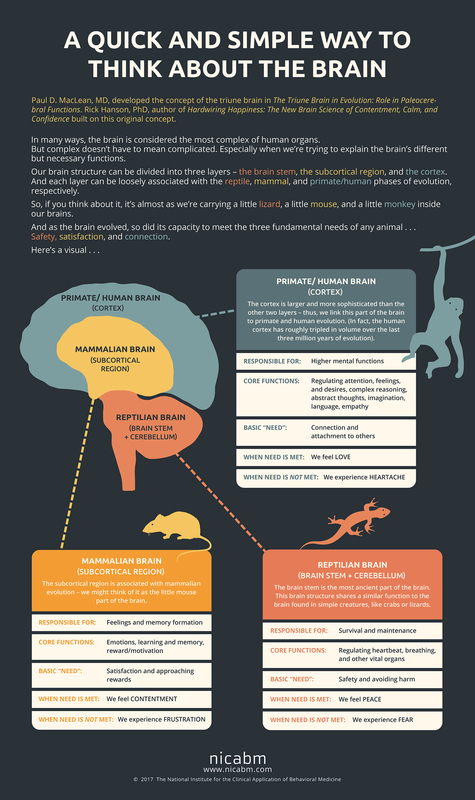 From page 81: “This illusory arrangement of layers which is sometimes called the ‘triune brain,’ remains one of the most successful misconceptions in human biology…Humans don’t have an animal brain gift-wrapped in cognition, as any expert in brain evolution knows.” Appendix D of the book has some graphics. 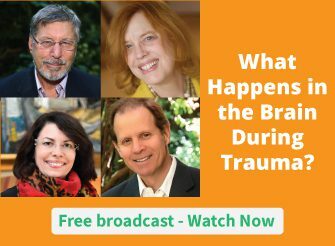 Perhaps PESI could do something with Lisa Feldman Barrett to advance a much more scientifically rigorous approach to the mind-body connection??? I completely agree with you – can we stop perpetuating the myths of pseudo neuroscience? Not only this is inaccurate but also a very outdated information. I would too recommend Lisa Feldman Barrett’s book for reference on this topic. Thank you ” Jim says” I am going to buy her, Lisa Feldman Barrett’s book. I would love a course on this too. I am very thankful for this information. From the client’s view, I realize how much the sense of safety and seeking for peace has been a great importance for me, because I lack of this the most in my life. Being overprotected by my brother, who in fact, acted in an abusive way as he puts all his anger towards the younger. I trust him and accept him as he is but it is very naive – as I realize it now. His anger is more towards our father who has been aggressive and verbally abusive. I am not sure how to compensate for this lack of safety and hunger for peace. So far back I have not realize that this could come from another reason as well. But this info is surely enlightening. Thank you very much. Speaking as a client, I was looking up exactly this kind of information a few days ago. Maybe you would do one on the ANS? Thank you! Thank you once again, Ruth, for giving us another oh-so-helpful tool for use with our clients. And a nice summary of these I needed to review (or learn)! Thanks, as I was thinking how such a tool would be helpful. lovely! thanks. the English lit dude says: para 4 Is missing an if. cheers! Thanks. Just what I need for clients when I talk about their brain. As Paul Gilbert says we have a tricky brain! Ahh! All in one place . . . with pictures . . . easy to use. I’m anticipating giving this a lot of attention. Many thanks for not charging an arm and a leg for such usable information.